Wireless sensor networks are an emerging technology that can provide valuable information for a large series of monitoring and control applications. Comprising many monitoring scenarios with different particularities, as industrial management, weather forecasting, home automation, traffic management and rescue operations, just to cite a few, wireless sensor networks bring many possibilities for innovative applications that cannot be addressed by conventional wireless network technologies. When sensors are equipped with cameras or microphones, multimedia data can be retrieved from the monitored field, enriching the perception of the target area. However, the constrained nature of wireless sensor networks imposes many challenges to multimedia transmission, fostering development of optimized protocols. 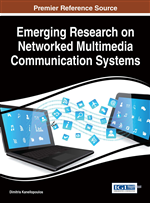 In this chapter, we present the state of the art of multimedia transmission in wireless sensor networks, covering topics as routing, error control, congestion avoidance, real-time delivery, compression and QoS, potentially supporting in the development of wireless multimedia sensor networks. In the last years, Wireless Sensors Networks (WSN) have been considered for a large series of monitoring and control applications. Employing tiny devices for sensing of some specific information, like temperature, pressure, humidity and luminosity, these networks have fostered the development of innovative applications for industry, home automation, healthcare assistance, weather forecasting, traffic management, battlefield surveillance, tracking, among many other monitoring scenarios (Yick, Mukherjee & Ghosal, 2008). Typically, sensor nodes in WSN are disposable electronic devices commonly equipped with a transceiver, a limited energy supply, a sensing unity and memory and processing resources, although additional modules can be found, allowing distributed information monitoring. However, in order to reduce costs for massive deployment and diminish energy consumption, resource-constrained sensors are expected to be deployed, bringing many communication challenges. One innovative nature of wireless sensor networks is the possibility to retrieve relevant information from regions with absent infrastructure. In such way, wireless sensor networks could be deployed in wide, hostile or even hard access areas. For that, however, sensors will communicate in an ad-hoc manner where data packets will flow through multiple hops from source nodes toward the network gateway (sink). As there is no central unit to coordinate and control communications, sensors are also expected to be self-organizing and protocols must be processed in a distributed way. Due to the inherent constraints of sensor nodes, however, protocols requirements must comply with limited processing, memory and energy resources; energy constraints limit the wireless communication range and inflict controlled use of transmission and processing functions. For a large group of applications, scalar data gathered from wireless sensor networks are insufficient, even if a large number of sensors is deployed. In order to enrich the retrieved information, sensors may be equipped with inexpensive low-resolution CMOS cameras and/or microphones, allowing multimedia data retrieving. The resulting Wireless Multimedia Sensor Networks (WMSN) enhance the understanding of the physical world, by improving monitoring and control applications (Almalkawi et al., 2010). In general, multimedia transmissions in wireless sensor networks are more stringent than transmissions of scalar data as humidity and temperature, imposing many challenges. And although optimized solutions may be employed, processing and memory constraints may impact the use of buffering techniques by communication protocols, as well as the execution of compression and entropy codes. Such complex scenarios have demanded protocols and algorithms that must be optimized for the particularities of multimedia transmissions in these networks (Akan, 2007). A typical heterogeneous wireless multimedia sensor network is presented in Figure 1. Visual and audio sensors will retrieve information with different particularities, requiring differentiated services to be provided by the network. Usually, multimedia transmissions in wireless sensor networks must be energy-efficient and scalable. However, some applications may also require timeliness, transmission fairness and error resilience. The monitoring requirements of the sensing applications will typically define the expected transmission services, which will be associated with some general characteristics, as summarized in Table 1.